40 years ago 20 million Americans pooled their energies and created the first Earth Day. As envisioned by U.S. Senator Gaylord Nelson, the day was to be filled with educational teach-ins. Thousands of colleges and universities organized protests against the deterioration of the environment. Isolated groups that had been struggling against issues such as oil spills, polluting factories, raw sewage, pesticides, loss of wilderness and extinction of wildlife suddenly realized they shared common values. The most impressive thing about the beginnings of the movement was its grassroots organization. “Earth Day” had no central governing body and simply grew on it’s own. The event is now celebrated in more than 175 countries. Earth Day in Loreto, BCS, Mexico, – “Loreto Pride in Action” – was celebrated on Sunday, April 18th. Fueled by the relentless dream of the local environmental awareness group and sponsor, Eco-Alianzia, this year’s event had over 200 participants from all walks of the community, with the greatest number being youths from Loreto. A location was selected that had become a dumping ground of local trash and garbage. Arroyo Candeleria is the second largest arroyo in Loreto and during the summer storm season, becomes a raging torrent, sweeping anything within its banks into the Sea of Cortez. To clean this dry river bed not only benefits the current environment by ridding it of trash and toxic chemicals carelessly left behind, but protects the waters and its inhabitants in the upcoming months. The event began with sign-ins at 7:30 in the morning. Participants were given name tags, t-shirts displaying the Pride Campaign logo of the Chocolate Clam, the Bay of Loreto National Park, Eco-Alianza and the Waterkeeper Alliance – and a handful of heavy-duty black trash bags. A short walk to the arroyo was the last easy task of the morning hours. While not quite a dump, the arroyo had more than its share of disposed diapers, fish heads, empty plastic bottles, tires, paint cans, spent or broken building supplies, broken roof tiles, clothing, discarded shoes, beer and wine bottles, along with molded reeking garbage. At times a gagging reflex interfered with collecting the waste. There are several reasons for the refuse. The primary is lack of education and an understanding of the relationship of the arroyo to the health of the sea. This year’s Pride Campaign logo – “Por un mar lleno do vida” – “For a sea full of life!” – was designed to increase awareness. The second and third reasons have to do with garbage collection. While there is a service, not everyone has garbage cans, and the pickup is only once a week. With fisherman, the catch – and resultant fish heads and remains – are often a daily occurrence. Most of them have no automobiles or trucks with which to transport the fish refuse to the city dump, and to put them in cans next to their house is to invite a fly fest and stench of unimaginable proportions. The fourth reason is based on habit – with a hint of laziness. It’s always been dumped that way. There hasn’t been demonstrated sufficient reason to change. Which takes the arguments full cycle back to the involvement of the youth in the clean-up process. Always, it is through the youth that real change is born and instituted. They may not be able to alter the behaviors of their parents, but they are learning for themselves the interrelationship of land to sea. For myself, I was fascinated that as I cleaned one area, there were layer upon layer of trash to be removed. Lifting up a bag of garbage revealed another layer of bottles. Picking up the bottles revealed another layer of tattered clothing. Lifting up the clothing revealed another layer of garbage and plastic. Bags of trash and broken furniture were loaded into pickup trucks and trailers headed to the dump. At last, the dusty, tired cadre of clean-up crew reached the end of the arroyo at the highway. Behind us – a pristine environment – the efforts of our labor clearly visible to all. A barbeque luncheon on the beach at Rancho El Jaral was hosted by Eco-Alianzia for all the participants. A quick dip in the turquoise blue waters provided the perfect antidote for the dusty cleanup. “Loreto Pride Campaign” pooled the energies of several local groups, including Rare Conservation’s Director of the Fisheries Fellow Program, Cynthia Mayoral, The Bay of Loreto National Park, the “Pride” Campaign Manager, Perla Lozano Angulo and her colleagues, and Edna Peralta, program coordinator for children’s education and outreach programs of Eco-Alianza. The ultimate goal of Earth Day is that every day becomes a celebration of the planet we call home. Again, it’s our job to protect her, to nurture her and increasingly commit ourselves to living within a sustainable envelope. We all win – the earth and us – when we make conscious choices about our food, water, consumables and waste. Be thoughtful. Be careful. Envelop the planet with the same love with which you shower your children and friends. 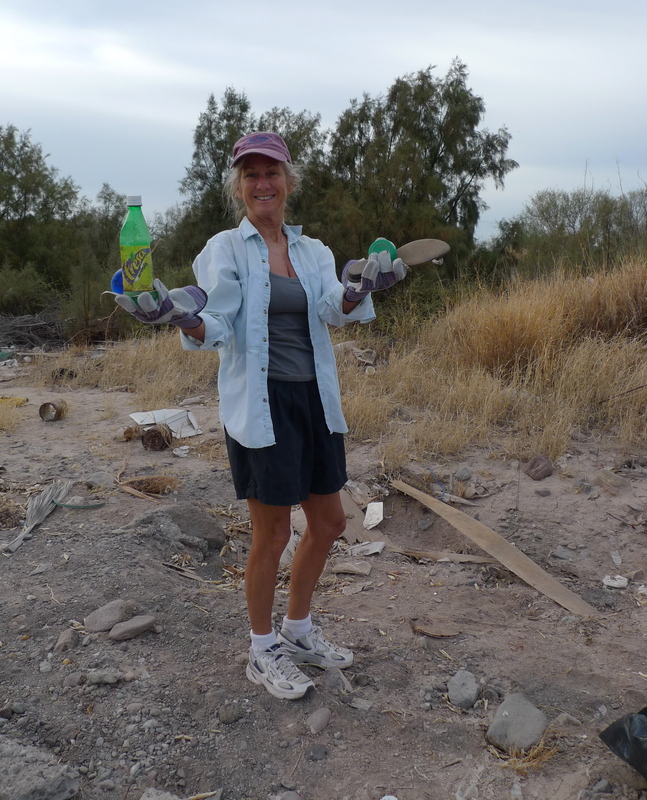 Catharine Cooper loves – cleans – and supports wild places. She can be reached at ccooper@cooperdesign.net. This entry was posted in Baja Living, Environment, Family & Friends, Loreto. Bookmark the permalink.